The battle of the rockers on the rock might have laid the foundation for a much larger battle. The cool temperatures (10 c) , fog and drizzle never fazed the 10,000 Stewart fans but it did have some interesting impacts on the seal debate. Stewart, his band and the the dancers arrived in St. John's unprepared for the weather. Who needs coats in July? 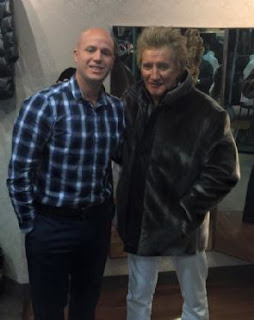 So, on the eve of the concert at Confederation Hill, Rod Stewart and his entourage went shopping at the province's premier furrier looking for a seal coat and some seal capes. Pictures of the singer posing in the coat went viral leading to a social media battle royale. The seal hunt and the entire fir industry is a divisive issue in Europe and the United States where many celebrities have joined ranks with anti-sealing groups to lobby governments to ban the import of seat products. The result has been catastrophic for seal hunters who humanely harvested burgeoning seal populations for pelts, oils and health products. Newfoundland an Labrador has been ground zero for the hypocritical, misinformed propaganda offensive against the hunt for generations. Markets for seal products are closed in the United States, the European Union, and Russia. Stewart could have went with a safe choice, like a canvas or Goretex coat. Instead, he opted for a stylish sealskin coat. His decision has raised the cackles of pro-animal rights music industry and movie celebrities on both sides of the pond. Stewart could catch some flack from fellow UK Rock Legend Sir Paul McCartney who has visited the ice flows in a couple of occasions to harass seals and condemn the hunt using deliberately misleading propaganda. One of former Premier Danny Williams finest moments was when he took the aging Beatle to task on Larry King Live exposing him as an ill-informed, hen picked, controversy chasing charlatan. I will never forget Williams challenging him to come to Newfoundland and his retorting "but I am in Newfoundland, Danny" - while he was actually on Prince Edward Island - destroying any credibility he might have had. It is reassuring to know that folks like Rod Stewart are able to sort through the propaganda and make decisions based on logical rationale not emotional propaganda based on lies and emotional extortion.